The June results are a bit worse than they were in May, but overall not terrible. 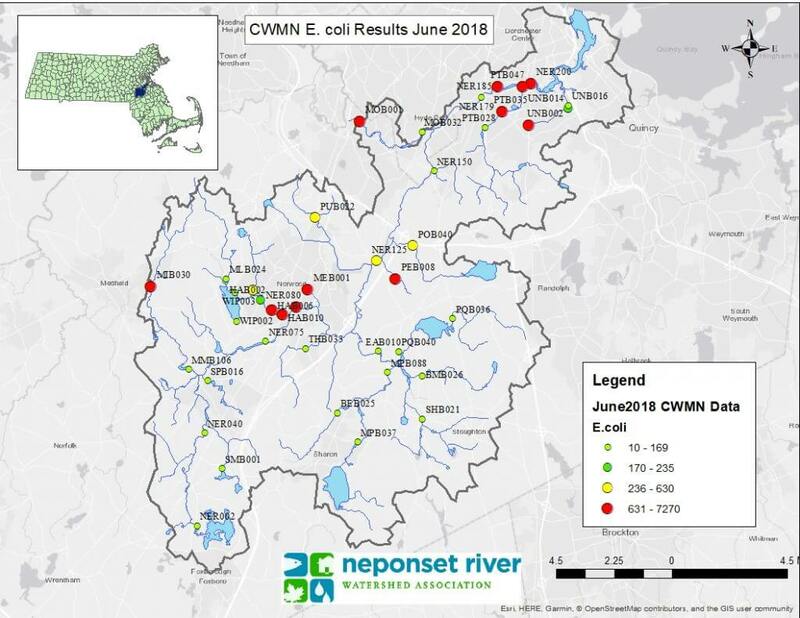 Despite the fact that the June data were also collected during dry weather, many more sites failed to meet water quality standards for E.coli, nutrients, and dissolved oxygen in June. Unfortunately, that pattern isn’t entirely unexpected, as water quality typically declines as the summer progresses. Sixteen of the forty one sites that we tested failed to meet safe standards for swimming, and twelve of those sixteen sites also failed to meet safe standards for boating. That is up from seven sites that failed in May. Of the sixteen sites that failed, Pine Tree Brook (Milton), Unquity Brook (Milton), Purgatory Brook (Norwood), and Meadow Brook (Norwood) were repeat offenders. All of these sites have been on-going issues in the watershed. Milton has been investing a lot of money in upgrading their stormwater infrastructure around Pine Tree and Unquity Brooks, and we are continuing to track down sewage issues that are affecting water quality in Milton. We’ve been investigating Purgatory Brook this year, but have been unable to locate any specific sources of contamination yet. Sadly, it appears we may have jumped the gun on declaring Meadow Brook fixed. 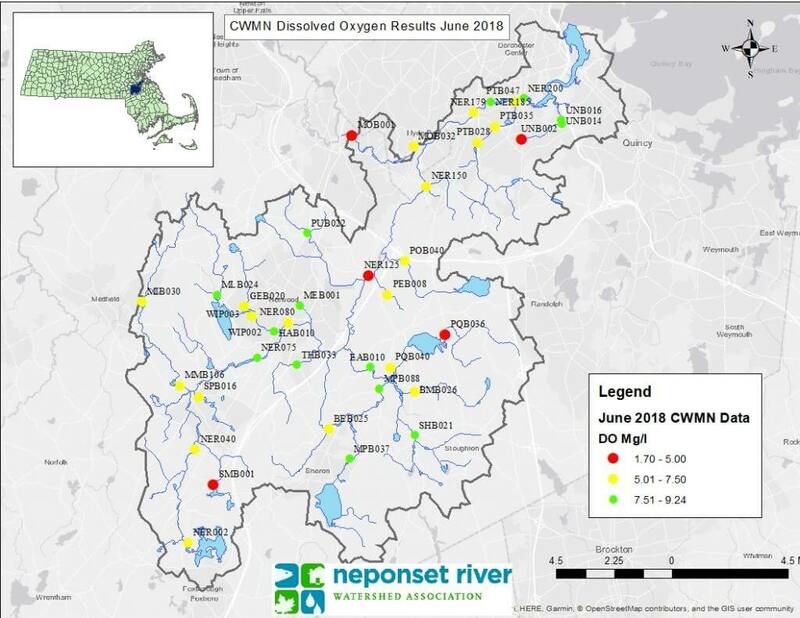 Last year was the first year in the twenty years that we’ve been monitoring the Neponset that Meadow Brook met swimmable water quality standards. This is a direct result of all of the tremendous efforts Norwood has been making to improve their sewer infrastructure. While Meadow Brook is still trending below the E. coli levels of years past, it has yet to meet swimmable standards this year. Check out the map below for the June results for all of the sites. Other notable sites that were high for E.coli for the first time this month were Hawes Brook (Norwood) and upper Mother Brook (Dedham). At the time, flow had been almost completely cut off to Mother Brook from the Charles River for dam repairs downstream. This caused the upper section of Mother Brook to become a stagnant pool, turning the river bright orange and causing the dissolved oxygen to crash and the E.coli to spike. It doesn’t help that there is a major illicit discharge going into the brook from the Transfer station. We plan to investigate Hawes Brook this week to figure out if these results were an anomaly or the start of a new issue. Dissolved oxygen is what fish and other aquatic animals need to breath under water. Warmer water holds less oxygen than cold water, so its typical for dissolved oxygen levels to take a dip as the summer progresses. This month seven sites failed to meet dissolved oxygen standards that are considered healthy for fish and wildlife. That is up from one site last month. Surprisingly, none of the ponds, where we typically see dissolved oxygen problems, had issues in June. Phosphrous is a critically important nutrient for almost all plant life, however when nutrient levels are too high it can wreak havoc on aquatic ecosystems. 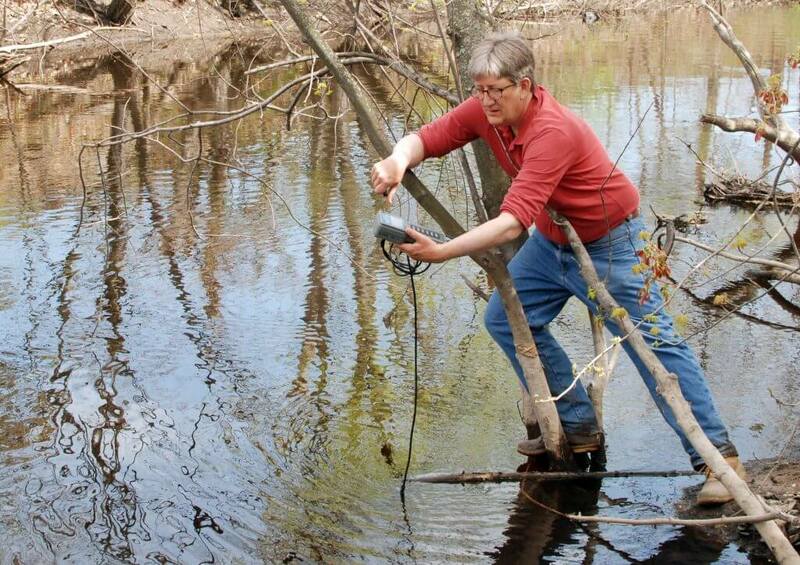 This is a major challenge faced by the Neponset River. In June, eighteen of the sites failed to meet Phosphorus standards which is up from just six in May. Warmer water can trigger the release of phosphorus trapped in sediments which can increase the amount in the water. June is also a popular month for people to fertilize their lawns and gardens. Fertilizer laden runoff is an important source of phosphorus in the Neponset. Thank you, to all the volunteers that dedicate their time to make this program possible! Have you seen information as to more optimal lake pond depths. The local river systems seems to have a lot of sedimented (with leaves and such) basins, possibly from the choked flow. do these clogged beds inhibit spawning, or lead to quicker lethal temp spikes. Long time no see. I hope you’re doing well. That’s correct the sedimentation of ponds is a major issue. As they get shallower they get hotter and as they get hotter they become more oxygen depleted. The heat isn’t just a problem in the pond either, as the hot water flows out of the pond it can take quite a bit of distance for it to cool back down to normal temperatures. Most of the ponds in the Neponset Watershed are the result of dams that have been long abandoned by the industries they used to support. Dredging the ponds is one option. Its often a very expensive one because many of the ponds have contaminated sediments as a result of the industrial uses. Dredging is only a temporary fix. The processes that have led to sedimentation will continue and the ponds will eventually fill back up in a matter of years, and will need to be dredged again. On top of those costs the dams that are causing the ponds to form need to be maintained, many are not, and that can be extremely expensive over time. Personally, I think we would be better off in the long run to remove many of the dams, and let the brooks go back to what they want to be, brooks. Environmentally removing these ponds would eliminate the temperature and dissolved oxygen problem, improve habitat quality and substrate, and it would allow for fish to travel freely up and downstream as they please (dams are difficult to impossible for fish to swim over). Economically, it would be more cost effective than dredging, reduce the risk of flooding downstream, increase climate change resiliency, and finally it wouldn’t need to be maintained over the long term. Some of the larger ponds like Willet and Lake Massapoag are functioning great as habitat and I’m not really advocating for removing those. 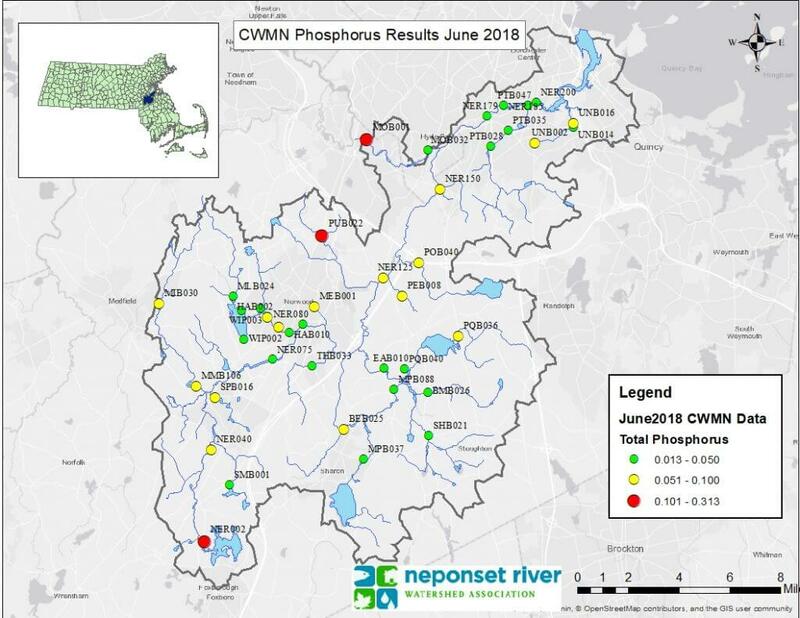 There are over 100 dams in the Neponset, many of them forming ponds of an acre or less whose elimination in my opinion would be of great benefit to the Neponset.